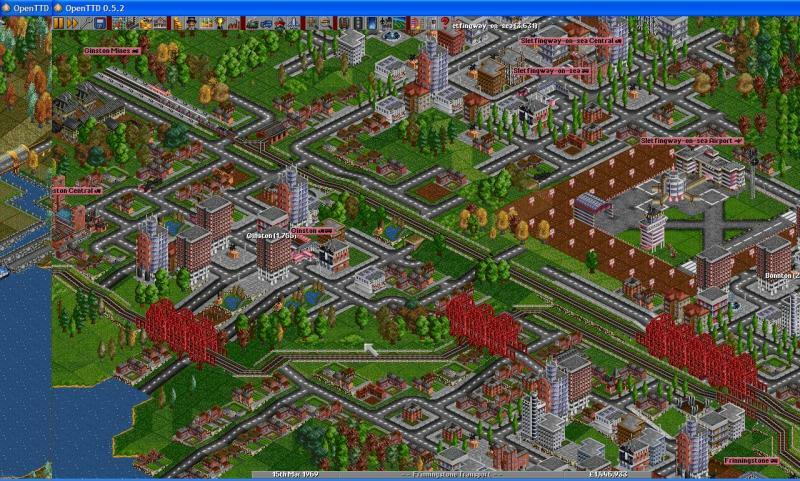 So, you've heard of Transport Tycoon right? Right? 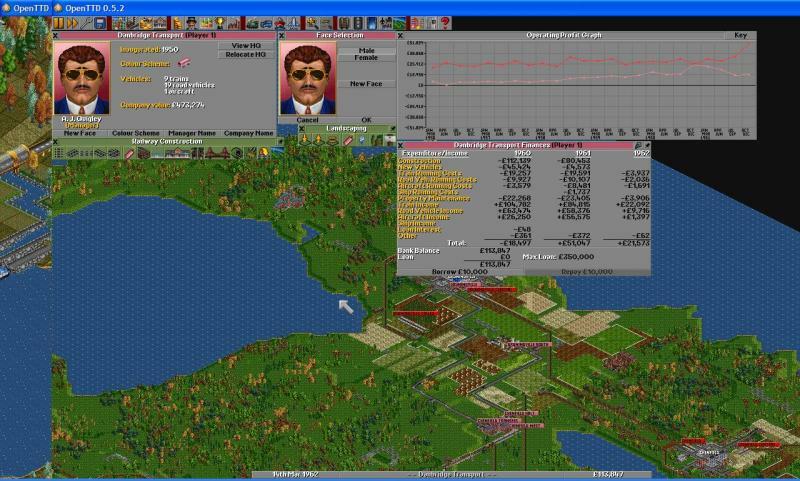 This game is literally responsible for 90% of the games with Tycoon in the name. Developed in 1995 in the days of low-budget basement games comes an instant classic from the now renowned Chris Sawyer. 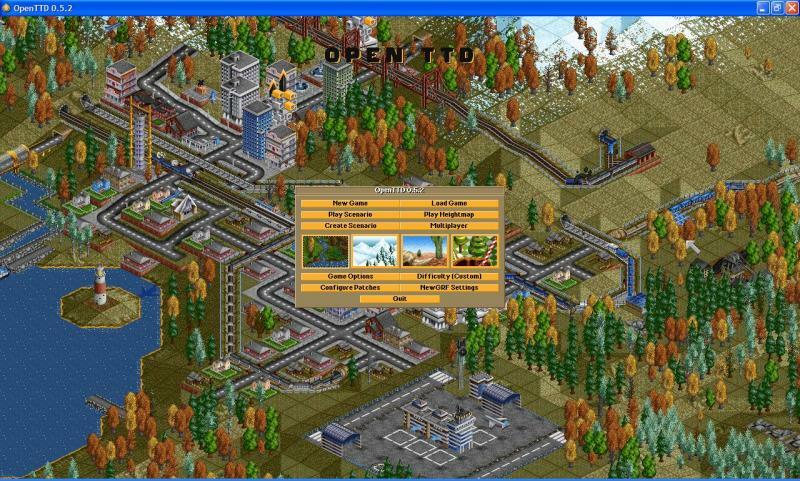 TTD has been reincarnated in the form of Open Transport Tycoon Deluxe, featuring new compatibility with newer systems and boasting an entirely new level generation system, AI and, most interestingly, a functional net code with game browser. 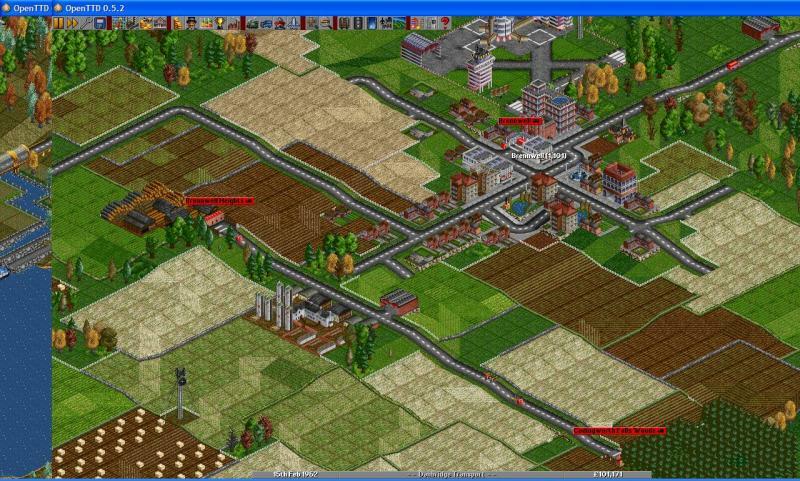 The gameplay of the Transport Tycoon franchise has always been simple with the interface built of intuitive controls and with an emphasis on graphical buttons and commands. The premise is you, a budding entrepreneur, take out a sizeable loan and start up your own transport business. Starting from scratch on a map randomly generated or seeded, your goal is simply to make as much money as possible, pay off your loan and wipe out your competitors. The game is completely free form, lacking any level structure or objectives system making goals purely player based - this means that you can effectively start in any way you want - your only limit being what time you start in. The game, set in one of four themed settings, ranges from 1950 - in which the only transport options available to you will be either buses or steam engines - and 2050 - where new advances make rail track obsolete and magnetic track trains become the norm. The four transport options available are road, track, water and air, with a typical road system being a bus service from town to town. Being a precise remake, the game feature the original build system, which would involve clicking and dragging to place track and clicking individual buttons to change track direction but it also provides a new auto-rail build tool, one of the many tools which makes creating track systems easier by enabling click and drag in any direction and adding an overlay to ensure proper placement. Essentially every transport system contains three elements: a track, a depot and a vehicle. Vehicles are very easy to handle and require only pointing in the right direction in order to make a functional service. Connecting a coal mine to a power plant is a simple matter of linking the two by track, adding a depot and creating a train with coal trucks. With more complex systems there comes a need for signals and advanced way points, both of which the game supplies. Destinations are set simply by telling the vehicle to "Go to" then clicking on a station in the game view. What makes OTTD, and indeed TTD the original, special is the simplicity of the action but also the reward of the task. Unlike many of today's simplistic games the better you get at TTD, the greater the accomplishments. When first starting it is possible to fail completely as your left, struggling to understand what your meant to be doing or wondering why your services aren't making enough money to cover your losses. This, coupled with the lack of tutorial, lead to a steep learning curve which may turn many modern gamers with short attention spans off playing. There is, however, a real sense of accomplishment as your first train, full of wood, arrives at the sawmill. The major replay value is the multiplayer. When you've honed your skills, or are simply looking to see what others have accomplished, there are many online servers in which other players have built, are building or have yet to build. Be warned, however, OTTD is a long game, some multiplayer empires often built over the course of days on the many continuous servers. Graphics are modelled as closely as possible to the original, thus don't expect anything hugely impressive but the graphics are certainly serviceable and are in keeping with the games charm. Sounds are all either original or remade to sound as near to the original as possible with music in an ambient, jazzy theme. The game play is intuitive and fulfilling but lack of tutorial makes the initial leap difficult. Graphics are as similar to the 1995 original as possible, 2D isometric and cartoon-ish. Sound is fitting to the game with an impressive ambient soundtrack. It does bare mention, however, that since TTD remains a commercial, copyrighted, game any remake or mod to it still requires the original to run. This means that although OTTD is practically stand alone it does require files from the original game to be present on the computer. This wouldn't really be an issue as the game can be found for as little as €5 - well worth it for this classic - but it has become rare and is near impossible to find in stores.